Pattern Pulls it all Together. Often people are scared of mixing pattern as they are scared their rooms will end up looking like a jumble sale….well, it can do when it is done badly, but once you have started to follow the few rules below, you will have no fear. Pattern is a great way of adding zing and pulling all the various elements you have together in a room. It is also a great way of connecting styles and bringing different colours together you may have in a scheme. 1.Patterns need to be consistent with each other visually, but create an atmosphere. For example, a tribal pattern would bring together an exotic African earthy style, or a Floral design may bring together all the pretty colours you have in your cottage. 2. When mixing start by using colours in common. For instance if you have corals and blues in your pallette, then work with the same colours. Here you can see the have pulled the emerald green and white out of the floral and used in a geometric/animal print. 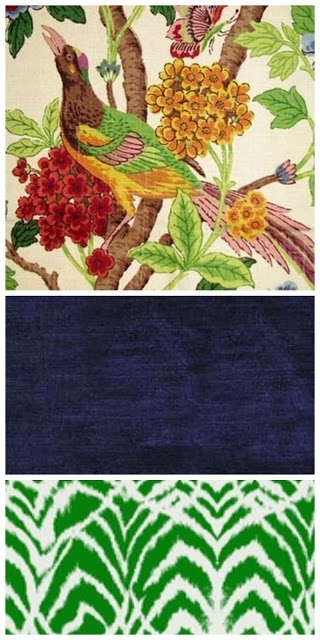 The blue velvet is also in the floral fabric and it has been used to coordinate in a velvet blue. 3. Next mix a large scale pattern with a small. Eg. a large floral pattern will balance a small one when the colours are in common and vice versa. This is exactly what they have done at Burlap and Lace. 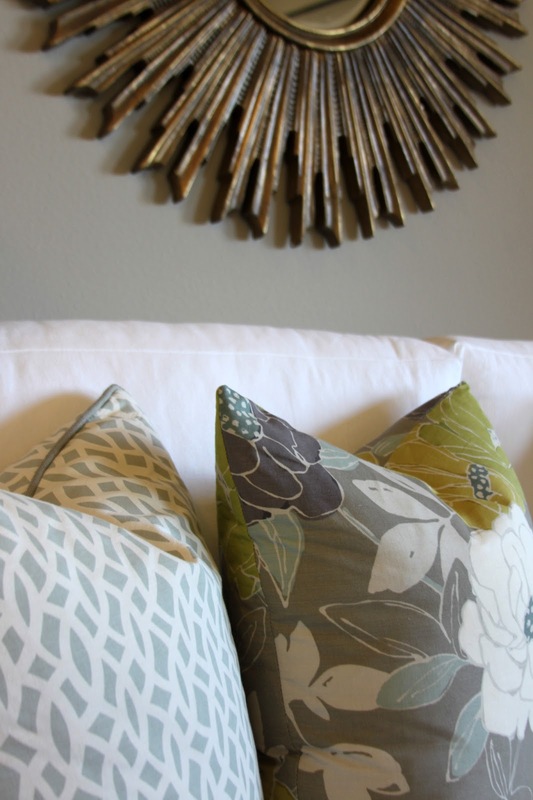 Visit this page as she has done a really good blog on pattern mixing! 4. Then, add in geometrics such as plaids, checks, diamonds and stripes. They will all easily coordinate with a pattern if it is in a different scale and have similar colours. Geometrics are huge in interiors at the moment, so use them to update your scheme. Here you can see that Tara Bussema has used a central patterned cushion on the sofa to pull all the different blues and greens together. 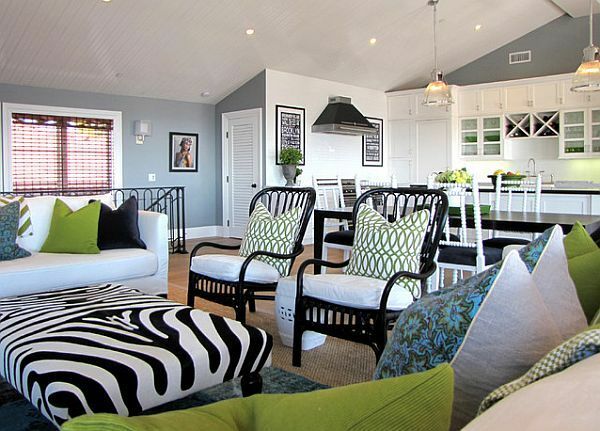 Then she has used a chevron stripe (throw over back of the sofa) & a geometric (Green and white) along with a zebra print to bring in the wicker chairs and other touches of black in in the room. Looks Fantastic and is a fresh and great example of pattern being used to bring it all together. Now what is scary about that? If you have just one depressing lonely light in the middle of the room please disconnect it. Electrician advisable! Why? Because it does nothing to highlight your wonderful displays, focal points and pictures you have created. Light doesn’t get into all those nooks and crannies and corners of a room with a single hanging pendant. It also does nothing for the atmosphere of the room, which is what the whole aim is. What we’re saying is you want to create romance and drama, with the lights. Yeap, exciting huh? Three types of lighting are required to make an interesting interior. Accent, Ambient and Task lighting. Accent lighting for depth and shade, highlighting an area or displaying or wall washing some pictures you have hung. Ambient provides the warm pools of back ground lighting to create a soft welcoming mood. Task lighting is for things like working, reading & cooking. Where to start putting the lights? 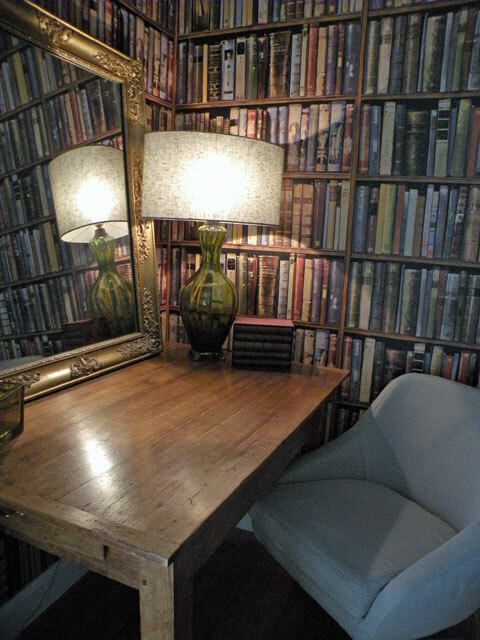 As you have moved around your furniture and got it off the walls, place a couple of table lamps there for starters….do you want to read or sew there? In which case you will need a task light too. What you want to is create is light interest from different sources so you highlight the areas and draw the eye to your focal points. Again they don’t need to be mitchy-matchy-Laura-Ashley, but do make sure they are at different heights to create difference in scale & moods. Above you can see task lighting on the LHS for a desk and then on RHS- love this – putting two lamps together to highlight a corner of a sofa and the modern abstract art behind. Better than the pendant, no? It doesn’t need to cost a lot of $$$, but does take a little time and imagination. Local chain stores have some cool pieces that add the twist you require. Also vintage lamps can look fabulous with new shades. (Above photos) & Shown this picture before of the vintage lamp below, highlighting a corner of our man cave – bought in the local charity shop, replaced the shade and removed the Nana plinth it was on. Now we have some cool lighting, different to everyone else’s and for a fraction of the cost. Oh, and Don’t forget candles & fire light too! (Just added the romance). All of this will make a room seem more welcoming. Does your room have 50 Shades of Grey? When it comes to Colours we are sad to say too much good taste is just dull and bland. An all cream interior is predictable and cliche–Resene “tea” on the wall, porridge carpet on the floor, rolled oats on the ceiling. Cream, taupe, black – yes, classic, but it is not an imaginative colour scheme and neither is painting your walls in Pearl Lusta, Spanish White, Magnolia or Tea. It looks so boring. Why? Because it is all the same tonal depth. And texture is often missing. A Tone is created by adding both White and Black which is grey. Any colour that is “greyed down” is considered a Tone. Tones are somehow more pleasing to the eye. They are more complex, subtle and sophisticated. 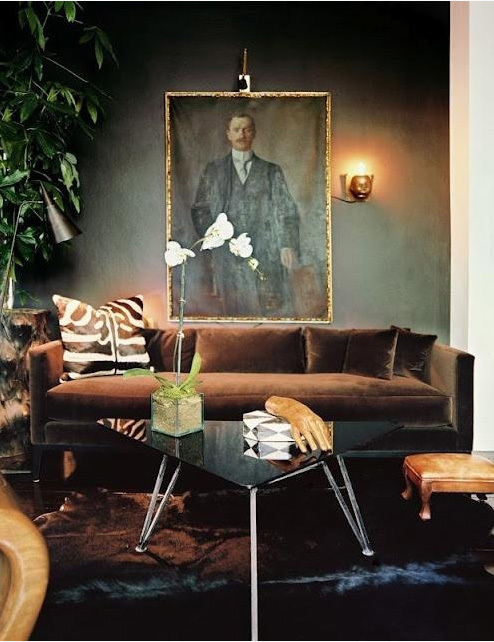 Tone is the depth a colour is & you need all tones to make an interior work. So instead of porridge, oatmeal and tea coloured interiors, think Muesli – Are there some pieces that are darker (raisins), some that are medium grey(linseeds, sunflower seeds), & light grey (Macadamias & nuts) & white (coc0nut threads). If not you need to add them. These tones will give you the tonal mixture & depth your room requires to give it depth. Still not sure what we are talking about? Take a photograph and then print it out in black and white. Now have a really good look at it. Does it show you 50 shades of Grey? You should see all the range of Greys, from the very dark nearly black ones, right through to the lighter white ones and all 50 shades of Grey in between. So, comparing the two photos below you will see the second one has got all 50 shades of grey, the first one not so much, though all the deeper tones there are providing a textural interest that is much needed. Opposite to the all cream oatmeal/porridge interior is the one that has too much dark tone & no texture. The Black leather sofas, dark shiny furniture – seen that? Well again it is boring, predictable, and very heavy and soul less. So Tone it up, Mix it up with lighter shades of Grey, & layer it up with textures. Below you can see Dark cleverly done. All Shades of Grey tones are here:-lighter tonal contrasts are in the chrome legs, zebra print, white orchid & print. There is also lots of textural contrast. Soft matt Velvet sofa with shiny glass table. Chrome legs. Plant in corner, soft shiny rug. Leather topped stool. These all contrast with a Matte wall paint- masculine, super snuggly style. To create style in your home you also need a lot of time:- time to play around, to try different things, to get it just how you want it. It takes time to do these experiments. Be warned it becomes addictive! Try not to buy anything that is mass produced- it will just look samey as you will see it everywhere. Get imaginative. Become a Hunter and Gatherer and Fossicker. (Be warned you have to steal your chances especially when browsing with hubbie!). Buy pieces from thrift shops, auction houses, flea markets, garage sales, 2nd hand shops & Trade Me. Paint it a different colour or clean it up – at least no one else will have it and it will instantly make your room different. The LH picture is an old Rimu cupboard we purchased in a 2nd hand shop down country a number of years back. It came from a Sunday School and even had a copy of the Psalms in it! It looked a little “Nana’ so we added the mouldings on the front and set to with a paint job. All up cost about $300NZ. Not bad when you consider an armoire costs $1000’s! It fitted the gap in our downstairs bathroom perfectly and is now full of towels and bathroom gear. TheRH lamp below is one of a pair that we bought from the Hospice shop in St. Heliers. We bought them because they matched our modern green chairs in our lounge. We then took off the wooden baseboard & had new drum-shaped lampshades made so it now adds a twist to a dark corner of our lounge. The French Farmhouse kitchen table the lamp sits on comes from an Antique Auction house. 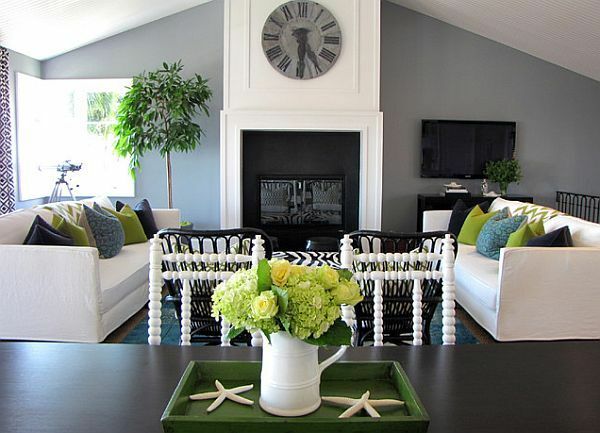 Be inspired this winter with speedy tips and hints on how to make the best of your interiors. We’re doing a talk at St. Heliers Library next Wednesday 12th June from 6.30pm so please join us for a fun hour. Rather than doing a hand out we are going to post sections and photos from our talk here for the next week, so you will always have it to refer back to. Enjoy!